Completely eliminate unwanted programs, toolbars and plugins - for a faster, cleaner and more secure PC! Not just for specialists but for everyone! 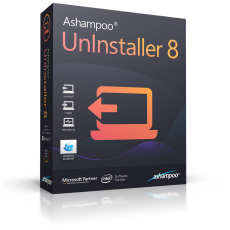 Even beginners will have no difficulty using Ashampoo UnInstaller 8. With the redesigned user interface, every function is just one click away and complex procedures become self-explanatory. Enjoy hassle-free program removals without leftovers! Find out what's really going on your PC during installations and rid yourself of unwanted clutter. It's the perfect choice for beginners and pros alike! Ashampoo UnInstaller 8 combines four different techniques to eliminate installations down to the last byte. Log files created by UnInstaller 8 during installations are the most reliable approach since every file and Registry modification is recorded. Uninstall scripts provided by each program are also used. If a dedicated profile is available, it will also be processed. Finally, a deep system scan is run following the uninstall procedure to detect and eliminate any leftover files and Registry modifications! Until now, completely removing unlogged installations was difficult with both files and Registry keys often being left behind. 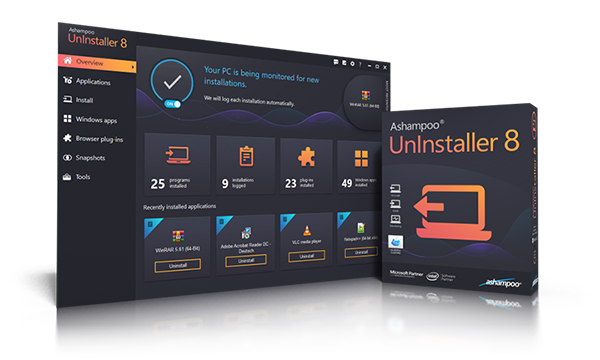 Ashampoo UnInstaller 8 features installation profiles for many popular applications for complete removal even without dedicated logs. This is especially useful for complex setup routines and, in tandem with our Deep Clean technology, guarantees perfectly clean uninstalls down to the last byte! 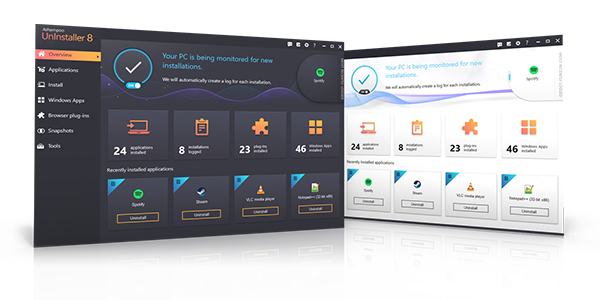 Ashampoo UnInstaller 8's installation guard constantly monitors your PC while being incredibly lightweight on system resources. But even if you remove applications through Windows' default means, UnInstaller will perform deep system scans to make sure nothing gets left behind. In most cases, UnInstaller will even detect the beginning and end of installations automatically so you won't have to do a thing! Numerous UnInstaller users have asked for a hassle-free module to permanently and irretrievably delete sensitive files. File Wiper does exactly that and with military-grade precision! By overwriting existing files multiple times, even special tools can no longer recover your sensitive data and your privacy stays intact! A step beyond file deletion - shredding! Many files that are removed during uninstalling contain sensitive information like user profiles, payment methods or passwords and should be permanently deleted. Ashampoo UnInstaller 8 includes military-grade file wiping technology to protect your privacy. This ensures sensitive data is irrevocably deleted and no longer accessible even for special tools! 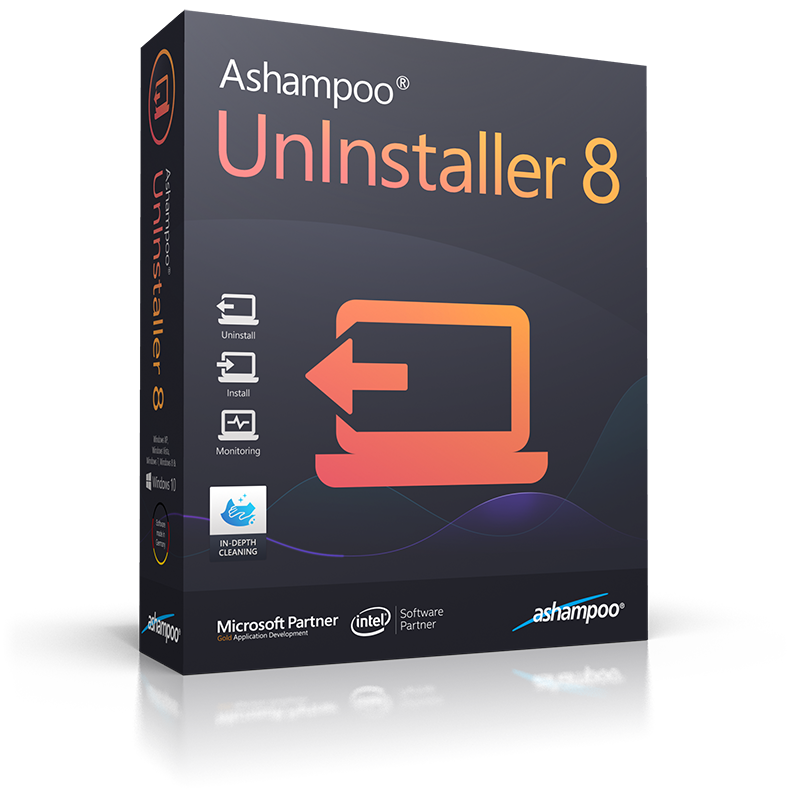 While other uninstallers have you slog through various submenus and dialogs, Ashampoo UnInstaller 8 makes everything easily accessible. Simply drag a desktop shortcut on UnInstaller's program icon to start uninstalling or browse through program categories or review recently uninstalled applications with a single click on the start page!